Looks or Personality .In its own way this Anglia has Bundles of both! Brought into our workshop with a carburettor problem and to have a LSD fitted, and the original lever arm suspension changed for a Milton Telescopic rear shock absorber conversion kit. ENGINE 1585cc Lotus Twin cam ,Power max big valve cylinder head, twin Weber 40 DCOE carbs, custom-made exhaust system, triple cored 105speed radiator. TRANSMISSION 2000e gearbox, Milton quick shift lever, Milton gearbox cross member,1200 prop, 3.54 :1 final drive. SUSPENSION. Mk 2 Cortina 2.25” coilover front struts, 200lb springs,Milton eccentric multi hole top mounts, Milton adjustable track control arms, Capri 2.8I hubs, Milton rose joint strut brace, poly-bushed through out. The highlight of the day for Dave, was the restored 1960 Mark1 850cc. in concourse condition, with 30,000 miles on the clock. Remember the long gear stick and the push start button on the floor? Her owner, was well chuffed to find out she had a Bhp of 32 at the flywheel, only 2bhp less than when they were produced from the factory new! Stood festering in a garage for over 10 years, this gem was brought in for body and major mechanical work looking very unhappy. Dave had to work his way through as everything was seized and several components had to be replaced and, modified. Thankfully the body and engine only required minor work and a respray. 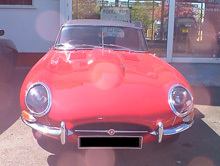 Owned by a local classic car enthusiast. 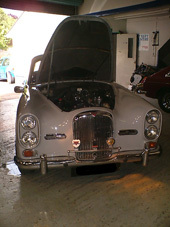 Brought in for an engine tune, as it was low on power and for the manifold gasket to be replaced. 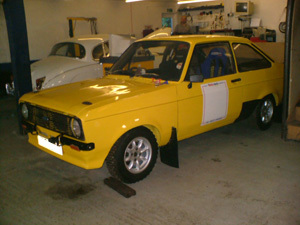 At present we own 3 classic cars .A 1967 Riley Kestrel that we use every day, a 1971 Hillman Hunter for Historic Rallying! 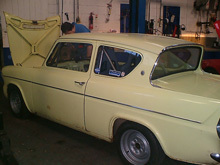 And a Morris 1100.I will try to feature regular reports on our cars, which I hope you will find interesting! We are members of the 1100 club and we featured her in an issue last year. (See link). Since this report, despite doing another 6.000 miles, she still hasn’t had a major service and the Carburettors still need over hauling. She has been just too reliable to take off the road. (Total cost of running expenses for her last year apart from the petrol was £96.00) Talk about cheap motoring! When we bought her we always intended to restore her, sadly now although the mechanical side of her is good, her bodywork has suffered over the last winter and we have decided that it will now not be viable to restore despite her rareity’. We shall keep using her until the Mot runs out at the end of the year and in the meantime look for something similar. It will be interesting to see how many more miles she will go on the same points, condenser etc when the service book says they should be changed every 3.000miles! The decision to find another similar car, is how we came upon the Morris 1100. We had seen Flo as she is known as, being driven around in Barnstaple and was surprised to see her on Ebay. Although we had never seen her up close, we thought she was in better condition than our Riley. Wrong! Disappointed when we bought her, she is now only suitable for spares.or repair. A couple of weeks after taking purchase of poor Flo, we were passing another local garage and on their forecourt was an Austin! We couldn’t get close enough to find out more, so I cheekily rang the owner who we knew well, to find out more details and if she was for sale. It turned out to be a British racing green Austin 1300 with one owner from new and 26,000 miles on the clock and yes she was for sale. Then came the bad bit. 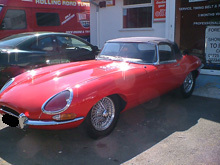 She was automatic and it needed new front wings, which the owner had and would include in the price. No harm in looking we decided to pop over and have a look.and were were glad we did. She is the most solid car that we have seen, never been welded, all the floor pans are like new, and every usual place that they are known for problems i.e. the trumpets door sills are solid .The only puzzle is why the wings and the front section by the lights are shot! Why is it that the most boring cars are usually in the best condition? We went away to discuss what we were going to do, didn’t take long to make up our minds and we have now made a gentleman’s agreement to buy the car. Now to get you totally confused with our plans. The Riley Kestrel has a lot of new parts, she also has a 1300 engine even though her log book states she was an 1100.We are now going to take these out of the Riley and put the engine from poor Flo back into the Riley and then sell her to someone who has the time to restore her, or alternatively sell her off for spares. The seats from Flo are better and we will replace these into the Austin 1300 along with my engine and gearbox from the Riley.We are still to make a decision on the colour. We are not sure whether to keep her the same or change. We will then keep this car for weekend driving and special occasions. In the meantime I am still looking out for another that will be drivable but not in concourse condition to use everyday for myself and the Dogs!